Back in the mid-1970s, a reboot of the X-Men comic book changed the face of graphic novels. In the early 2000s, the X-Men movies launched much of the modern comic book movie craze. PlayTech was pretty smart to get a license for an X-Men themed slot game. Does the slot honor the great characters from Marvel lore? It certainly does! The good guys and gals and the bad guys and gals from the X-Men franchise are all on full display. The top heroes such as Prof. X, Wolverine, Cyclops, Nightcrawler, and Storm are facing off against Magneto, Rogue, Mystique and other evil mutants on the game. Be on the lookout for the X-Men Logo symbol because it represents a scatter. Curiously, the word “wild” reflects the wild symbol. Why no creative image? The standard five-reel slot setup accompanies a full 25 paylines. Per payline, you can wager up to 10 coins. There are a full 8 denominations for the coins ranging from .01 to $5. Interesting, there are several coins worth less than $1 and this allows those with limited funds the ability to wager on the fun slot game. The maximum number of coins you can play on the game at one time is 1,250, which sets up a possible max jackpot of 10,000 coins. The second jackpot is a generous 5,000 coins. As is the case with other PlayTech hero slot games licensed from “The House of Ideas”, X-Men is part of the Marvel Mystery Jackpot. This is a progressive jackpot that offers a major payout to those whose spins land on three unique jackpot symbols. Please note that the higher the wager, the greater the chance of coming up with a progressive jackpot symbol. The “X Feature” kicks in during normal spins when superheroes – and only superheroes – show up on the five position on reels 2, 3, and 4. Heroes positioned this way make an “X” and this, in turn, could pay out five times the original wager. One of the interesting aspects of this game there are two difference modes of game features. The second three or more scatter symbols make an appearance on the reels, the free games feature arrives. Now, there are two different modes that develop out of the free games sequence: Hero mode and Villain mode. Hero mode comes with an unlimited number of free spins and the trip to the villainous dark side is only going to yield eight free spins. The free games features commences in Hero mode and will make the switch to Villain mode the second Magneto shows up on Reel 3. Once Professor Xavier appears on Reel 3, you are back to Hero mode. Every time you go back to Villain mode, the countdown from 8 free spins starts again at the number you left off at. Upon hitting zero, your free spin session is all over. The free spin feature also presents cool theme music designed for the game. There is no music at other points during slot play and, honestly, this makes things a bit bland. Once the music does make an appearance, it is going to be appreciated. Programming autoplay is fairly easy and this feature allows you to schedule a series of spins in advance. Speeding up how fast the spins go is another benefit to the game. Both of these features allow eager players to move quickly and enjoy their sessions. The X-Men theme is really cool and, even though the features are somewhat sparse compared to other Marvel games, X-Men by PlayTech is worth the time to try out. 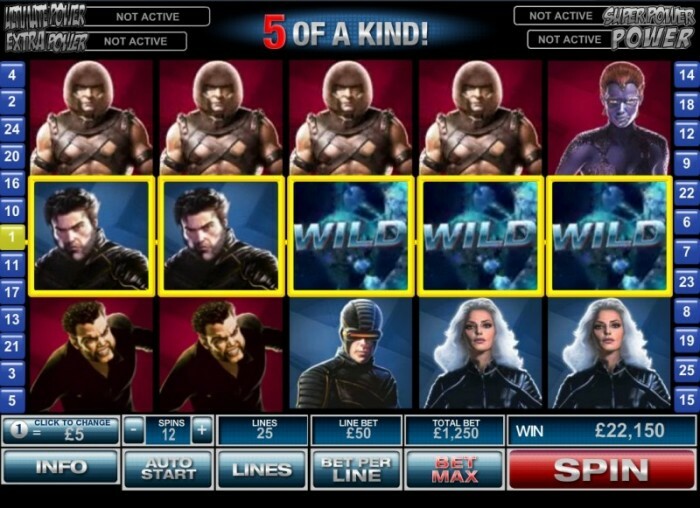 If you love slots and Marvel movies, you’ll enjoy your time playing this slot.